The weeks are sure picking up speed. My weight is slowly showing progress which is a good thing. I am so glad for TOPS weekly meetings that keep me accountable for stepping on the scale. And the knowledge I get from Sparkpeople that I am able to share at meetings. I just wish all members would be consistent. Seems attendance falls off in the Spring/Summer just when it should pick up but I understand busy lives. I'm making progress with the yard. I've cleaned up the picnic area near the open fire pit and spread fresh mulch. There WAS a huge forsythia bush right next to a burning bush that was growing out of control so I chopped that down yesterday. The garden is planted so now I wait to see it's progress. I still have some flowers to plant. This has been the worst year for critters. I planted in planters and they ate some plants to the dirt. I left some on my workbench and they ate some of them. I dug a 2 year old butterfly bush to give to a friend and set it out on the ground near my car. That was the wrong thing to do. I looked the next day and the bush was gone to the base of the plant. When I took my car to get an oil change and they found a big nest under the hood. We're trying to do things to eliminate THAT critter. We're just lucky there wasn't any electrical damage. WAR on Pack rats!! This weekend we travel to Illinois to one of dh's cousin's wedding. It should be raining when we go up but that's okay. Looking forward to the visit. The following weekend we go to Lincoln, NE, to the last gson's high school graduation. That time flew by. He was about 4 yrs when we married. Hopefully, it all goes well. I got a text from my youngest dd yesterday. 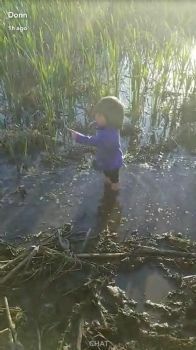 She sent a pic of my gdaughter who wandered out to see the tadpoles in a slew behind grandma's house. It could have been tragic but instead was pretty comical. Thank God for His angels that keep us safe. She wasn't wearing boots just some really cute white sandals. LOVE this girl!! I am curious about TOPS, will have to check it out. When my car had an oil change, a critter nest was also found in the engine. It was probably mice. To keep my vegetable garden safe, I have to put up a rabbit fence. The green beans would never survive.